In my travels around the state of Minnesota regardless of rural or urban, I have encountered a significant lack of flowers. Because pollinators rely on flowers for sustenance, this lack can lead to nutritional problems for pollinators. This is why Dr. Marla Spivak is always encouraging people to plant flowers as part of the solution to the “pollinator crisis”. The lawn is practically omnipresent in the landscapes of any building be it home residence, public, or commercial. As a culture, we have evolved into thinking that one’s lawn should be maintained in such a way that it is of playing surface quality meaning there are no broadleaf weeds present, and that the lawn is continuously verdant as a result of the choice of grass varieties, as well as fertilizer and irrigation regimens. One potential way to address the “pollinator crisis” personally is to accept broadleaf plants (perceived as weeds) to establish in one’s lawn. Given the mindset, this creates aesthetic problems. However, if one wishes to contribute to pollinator nutrition and accept changes in appearance, the lawn offers such an opportunity. Plants contribute to pollinator nutrition by: 1) providing sugary nectar predominantly as an energy source for the high demands required for flight, and 2) providing pollen as a source of protein and other nutrients for the development of their young. 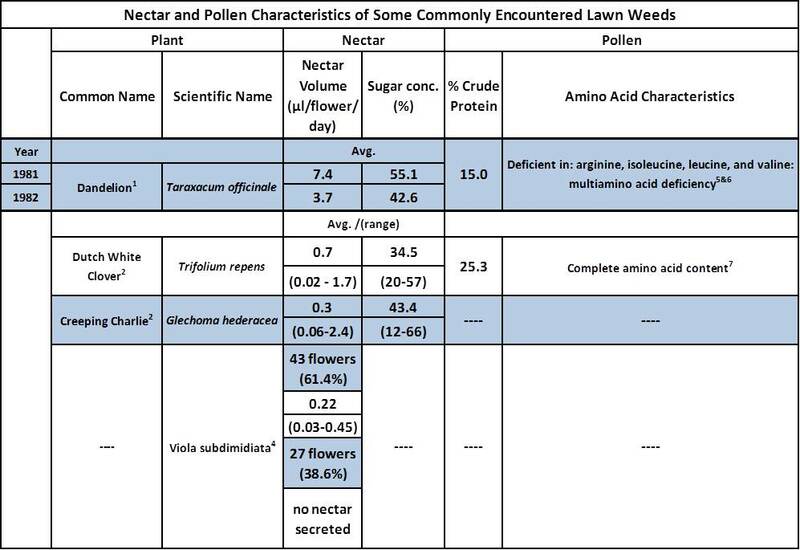 However, there is significant variation among plants in regards to: 1) both the quantity of and the quality of nectar provided, usually in terms of sugar concentration, and 2) the crude protein and amino acid content of the pollen. In this article, we will examine the nectar and pollen characteristics of two lawn “weeds”, dandelion (Taraxacum officinale) and Dutch white clover (Trifolium repens). Less information is available for creeping charlie (Glechoma hederacea) and violet species, so these will only be mentioned in passing. Dandelions are one of the most successful plants in having adapted to the mowing regimes inherent in our lawn maintenance practices. As a plant, dandelion has characteristics that lend to and detract from its value as a pollinator plant. As one of the first flowering plants in the spring, dandelion provides a plentiful source of nectar. According to the following table, "Nectar and Pollen Characteristics of some Commonly Encountered Lawn Weeds", the dandelion flower provides between 3.7 and 7.4 µl (micro-liters) of nectar daily. In comparison with other plants, this is a respectable quantity, as we shall see. In addition, the sugar concentration of dandelion nectar varies from 42.6 to 55.1% which is also a respectable if not high percentage. Notice the variation in nectar production in one year. Twenty percent (20%) protein content level is considered beneficial to bees; however, the pollen protein content level of dandelion is only 15%. Pollen with crude protein levels below 20% have been shown to contribute to health problems for honey bees. Dandelion pollen also lacks four of the essential amino acids required for protein synthesis. Therefore, bees feeding on dandelion pollen alone would fare poorly. In conclusion, dandelion makes a significant contribution to pollinators in the form of early spring nectar, but pollinators need to find pollen with a higher crude protein content and a complete essential amino acid complement in order to be healthy. Note: Superscript numbers refer to references cited below. In contrast, Dutch white clover pollen has an excellent crude protein content level of 25% and provides all essential amino acids. However, Dutch white clover provides nectar in smaller volumes and with a lower sugar concentration per flower than dandelion (see above table) therefore pollinators feeding on white clover will have to work harder to meet their energy needs by visiting more flowers. In addition, white clover blooms later than dandelion and thus does not provide a compliment to dandelion nectar and pollen. According to Southwick et. al in "Nectar Production, Composition, Energetics, and Pollinator Attractiveness in Spring Flowers of Western New York", a given population of flowers may vary significantly in nectar quantity and quality. This does not take into account withdrawals by other insects that can be happening continually. This will likely shift the mean nectar quantity per flower in a downwards direction. From the pollinators perspective, the probabilities of greater nectar reward are reduced. To clarify this point, consider the nectar volumes of Dutch white clover and creeping charlie (see above table). The range of nectar volumes encountered for creeping charlie is greater than that of white clover, but the mean nectar quantity encountered for clover is more than twice what it is for creeping charlie. From a probability perspective the pollinator captures greater nectar rewards from white clover than creeping charlie in spite of the latter’s higher sugar content. I was unable to find nectar and pollen data for our common violet (Viola sororia), but to the degree that plants in the same genus retain similar characteristics, please consider the following data. A Brazilian violet (Viola subdimidiata) contained less than average nectar volume and a significantly smaller range of nectar quantities than nectar of creeping charlie (see above table). In addition, close to 40% of the flowers sampled contained no nectar at all. If our common violet has flowers with nectar properties similar to the Brazilian species, it will rank relatively low on the pollinator attractiveness scale. Each flower is has its own nectar production and sugar concentration profile. What any individual plant provides in any one moment in time will be affected by a series of weather conditions as well as its recent visitation history. Nonetheless the averages permit ranking of flowers relative to nectar volumes created and sugar concentrations present. This comes down to the amount of energy that a pollinator can gather from any particular plant. Each flower will also have a pollen profile based on crude protein percentage and amino acid content. The nutritional qualities of pollen continue to be a subject of interest and it is likely that other characteristics will come to light as research proceeds. Variation among the reported nutritional qualities of pollen exists, but this variation is significantly less than that encountered for nectar quantity and quality variation. This appears to be due more to variation in research technique, and much less so to environmental influences (reference #s 6 &7).